Compliance sets the benchmark for risk mitigation. 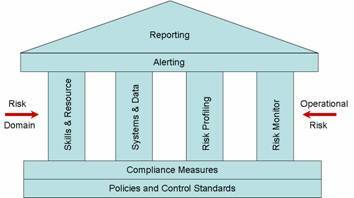 A compliance framework makes it possible to monitor identified risks, track trends and detect potential vulnerabilities. Complement this with an early warning system that can alert you to co-ordinate corrective actions thereby preventing potential breaches and consequential disasters. Based on your critical processes and key business driver's ∑ Vision can work with your team to review the risk domain: risk of potential loss resulting from inadequate or failed internal factors - processes, people and systems – or from external systems. At ∑ Vision, we work with certified managers and help you develop a framework and validate your strategies to take advantage of compliance , in a way that supports your business goals and delivers a solid return on your investments. It is said that ‘no business is without risks', while this is true; risk can be contained if it is anticipated. To mitigate risk it is important to understand it. “Risk” is defined as – “ The quantifiable likelihood of loss or less-than-expected returns”, and “the practice of analyzing exposure to risk and determining how to best handle such exposure” is known as “R isk management”.